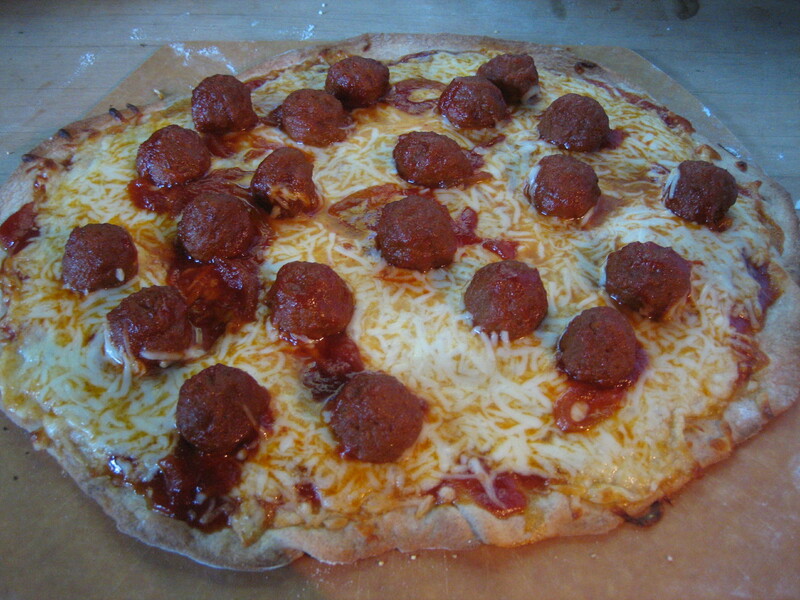 Today’s pizzas is a take on my meatball pizza – a staple of mine for many years and one of the first pizzas I blogged about when I started the 52 Pizza Project two years ago. But instead of marinating the meatballs in marinara, I used my mom’s sweet and sour meatball recipe. The final product was excellent: the sweet and sour sauce tasted delicious with the mozzarella cheese and the thin crispy crust. My family’s homemade sweet and sour sauce recipe includes white distilled vinegar, ketchup, onions and a few other items. I cheated on the meatballs though. I haven’t had my meatball lesson with my mother-in-law yet, so until then it’s store bought turkey meatballs. While the meatballs simmered in the sauce, I pre-baked the dough. Then I spread on the sweet and sour sauce, topped it with mozzarella cheese and the meatballs before putting the pizza back in the oven for a few minutes. The only thing I might do differently next time is cut the meatballs in half before putting them on the pizza to keep them from rolling off!